President Trump is mobilizing the vast powers of the military and other parts of the federal government to help bolster Republican election efforts, using the office of the presidency in an attempt to dictate the campaigns’ closing themes and stoke the fears and anxieties of his supporters ahead of Tuesday’s midterm elections. Trump in recent days has made aggressive moves aimed at pushing policies that could boost Republicans next week — deploying thousands of troops to the U.S.-Mexico border in the largest such operation since the Mexican Revolution, floating the idea ending birthright citizenship and warning he intends to halt the caravan of Central American migrants. The president has also moved to lower Medicare drug prices and suggested the idea of a 10 percent tax cut for the middle class, sending administration and congressional officials scrambling to assemble a new tax policy. The cumulative acts reflect the extent to which Trump has transformed parts of the federal bureaucracy into a factory of threats, directives and actions — an outgrowth of a campaign strategy which the president and his political advisers settled on as their best chance to hold the Republican congressional majorities. “This is the most focused and concerted effort to use all of the powers of the presidency to shape a midterm election that I have ever seen,” said William A. Galston, a senior fellow at the Brookings Institution’s Governance Studies Program and a former domestic policy adviser in the Clinton White House. “President Trump is pushing every button on the console and he is mobilizing all of the power, including the communications power, of the federal government on behalf of his party’s campaign in this midterm,” Galston added. The Center for Responsive Politics projects that more than $5.2 billion will be spent this election cycle, making it the most expensive midterm election ever by a wide margin. With less than two weeks before election day, $4.7 billion has already been spent by candidates, political parties and other groups such as PACs, super PACs and nonprofits. Prior to this election cycle, no midterm election had surpassed more than $4.2 billion in spending when adjusted for inflation. The overall estimated cost of the 2018 election would represent a 35 percent increase over the 2014 cycle in nominal dollars, the largest increase in at least two decades. Democratic House hopefuls have raised more than $951 million, crushing their Republican opponents’ $637 million haul. Things are closer in the Senate — $513 million to $361 million — but Democrats are still ahead. In every kind of competitive race — even those in red districts — Democrats are either outraising Republicans or keeping pace. Our cold civil w.ar grows hotter by the day. Between now and the election next week, there seems to be no apparent letup of violence in sight. We witnessed the Squirrel Hill massacre, one day after the arrest of accused mail bomber Cesar Sayec, and after two African Americans were shot and killed in Kentucky. The latest tragedy is a deadly school shooting in North Carolina, where the gunman and the deceased were students. At the same time, Donald Trump appears intent on continuing to shred the social fabric that ties our nation together. Welcome again to the new era where the president as unifier in chief is looking passe. Faced with the dual prospect of Republicans losing the House and expanding their control of the Senate, the president would not skip a beat, falsely claiming that the stock market barely took time off after 9/11, so why should he? As of Sunday afternoon, general election federal independent expenditures in California’s House races had ticked up another $6.5 million since Wednesday evening to just over $74 million. The Republicans’ Congressional Leadership Fund accounted for $3.2 million of the additional spending, with two $1 million+ buys in Steve Knight’s CA25 and Ed Royce’s open CA39 seat, along with another $885,000 in Jeff Denham’s CA10 and $290,000 in Mimi Walters’ CA45. New Republican PAC, which has spent over $20 million in the Florida Senate race on ads opposing Democratic incumbent Bill Nelson, made its first foray into congressional races around ten days ago with a $370,000 buy in CA45. 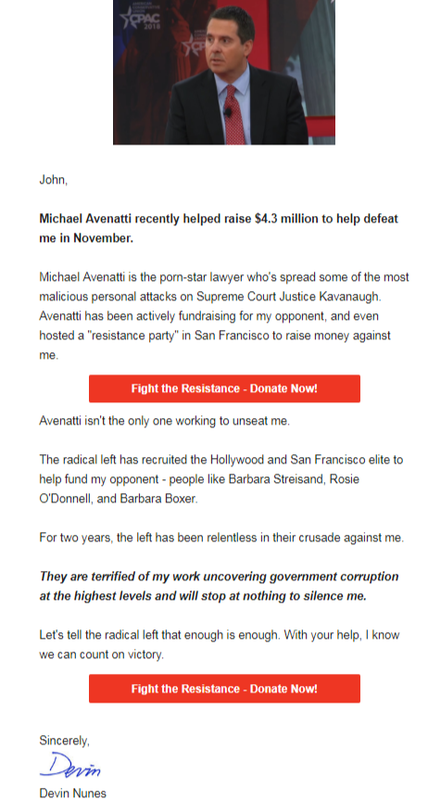 It followed that up just prior to the weekend with another $600,000 ad buy opposing Democratic challenger Katie Porter. Mike Bloomberg’s Independence USA PAC joined the pile-on in CA49, with an additional $500,000 TV ad buy supporting Democrat Mike Levin, bringing the outside spending in the race to just over $4 million, with none of it to the benefit of Republican Diane Harkey. The Democrats’ House Majority PAC made a surprise late buy in CA21 this weekend, committing a modest $257,000 to television ads opposing incumbent Republican David Valadao. The buy marks a reversal from several weeks ago, when the DCCC pulled its ad reservations from the Fresno market as they appeared to write off Democrat TJ Cox’s chances of unseating Valadao. The CA21 buy accounted for the bulk of the $511,000 spent by the House Majority PAC in California House races since the previous update. Republican Women for Progress, a committee funded largely by LinkedIn co-Founder Reid Hoffman, Wicklow Capital’s Daniel Tierney, but evidently no Republican women, spent $266,000 on ads supporting Democratic candidates in CA48, CA25, and CA50. In Defying the Odds, we discuss Trump's character. During the campaign, he openly encouraged violence by supporters. 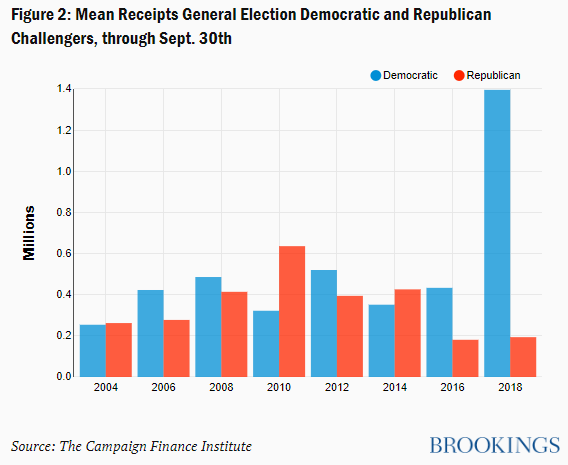 For the final two weeks of the election, Democratic campaigns and outside groups are on track to substantially outspend Republicans, strategists on both sides say. Democrats are set to spend $143 million on television advertising in House races, compared with $86 million for Republicans, according to one analysis by a Democratic strategist tracking media buys. Democratic super PACs and other outside groups are poised to outspend their Republican counterparts by a wide margin, erasing an advantage Republicans planned on having. Much of the Democrats’ unanticipated firepower comes from one source: Michael R. Bloomberg, the liberal former New York City mayor who may run for president, plans to spend about $20 million on House advertising through his super PAC, Independence USA, in the final week of the campaign, a Bloomberg adviser said. “It’s the suburban seats and it’s the flow of money,” Representative Tom Cole, a longtime Oklahoma Republican and former House campaign chairman, said of the party’s two overriding concerns. Bloomberg's Independence USA PAC has run ads all over the country. The report identified the most liberal constituency as “progressive activists,” a constituency that is expected to make up a quarter of Democratic voters this year, according to Stephen Hawkins, research director at More In Common. These voters stand apart with “the highest levels of education and socioeconomic status” of all the groups studied. They are “highly sensitive to issues of fairness and equity in society, particularly with regards to race, gender and other minority group identities.” In addition, a third of progressive activists view political correctness as having gone too far, compared with 80 percent of the population as a whole. There are a number of other areas where progressive activists differ from the average American, according to the More in Common study. Progressive activists are “more than twice as likely to say that they never pray (50 percent to 19 percent), “almost three times more likely to be ‘ashamed to be an American’ ” (69-24), eleven percentage points more likely to be white (80-69), and “twice as likely to have completed college (59-29). Using American National Election Studies data, Goldberg found that among white liberal women, the share identifying themselves as “feminist” rose from 45 percent in 1992 to 83 percent in 2016. For white liberal men, the percentage saying they were feminists grew from 34 to 59 percent. Democratic Challengers and Candidates in Competitive Elections: Filing to run is only the first step of a long process. To run a strong campaign, you have to raise enough money to get your message across to voters. In 2018, the raw enthusiasm of Democratic candidates for running has been backed by the enthusiasm of their donors. 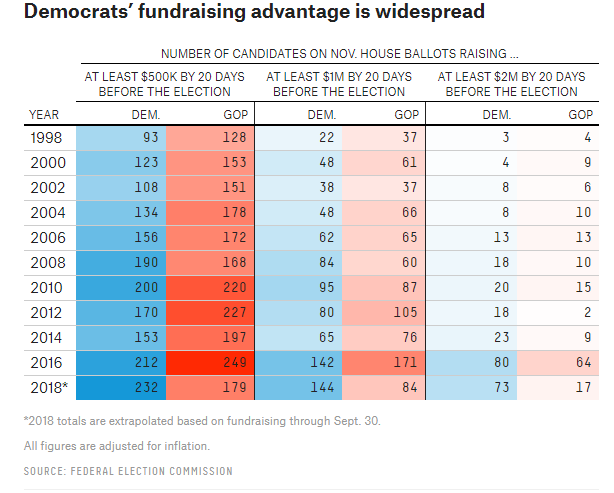 Figure 2 displays fundraising through September 30 for House Democratic and Republican challengers in general elections since 2004. In contests for the 42 open seats currently held by Republicans, Democrats have outraised the Republicans by an average of $2.2 million to $1.4 million. This is the only year since we began calculating in 2004 in which out-party candidates had a major financial advantage in open seat races. The only other time an out-party had even a slight advantage was in the GOP landslide year of 2010, when Republicans running for Democratic-held open seats outraised the Democrats by $1.2 million to $1.1 million. Approval: the losses are more severe when the president is unpopular. And despite a recent uptick, Trump remains unpopular. SCENARIO THREE -- GREAT DEMOCRATIC NIGHT: DEMS PICK UP 40+ HOUSE SEATS, NET 3+ SENATE SEATS. 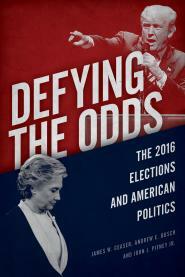 With a broad background of midterm history, congressional arithmetic, and the current political climate established, we can now turn to the more systematic estimates of how these factors are likely to come together in this year’s midterm. What follows are four independent congressional forecasts and one state legislative forecast that inform us about what we should expect to come out of this election. Table 1 presents a summary of these congressional forecasts. Although there are differences among them, two points are common. 2018 is likely to be a very good year for the Democrats in the House of Representatives. 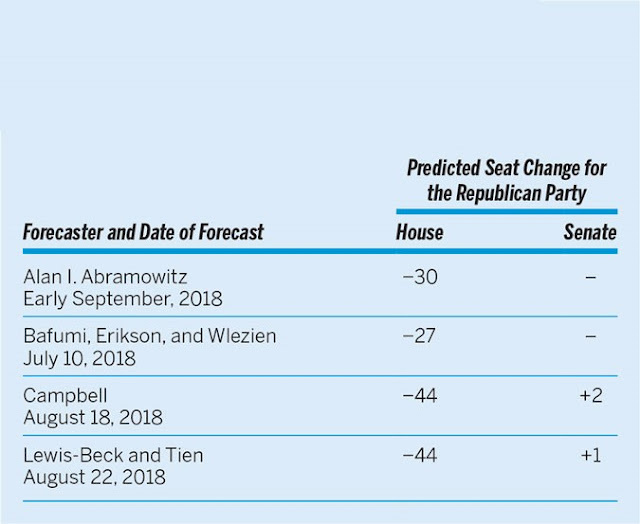 In fact, all four forecasts expect a Democratic House majority. In the Senate, Republicans are likely to hold their own and perhaps pick up a seat or two. So, on to the forecasts. At FiveThirtyEight, Nate Silver says that the recent uptick in Trump's approval ratings probably won't change things. Furthermore, the president’s party tends to do worse in the House popular vote than the president does in his approval rating. On average in midterms since 1946, the president has had a +11.3 percentage point net approval rating as of Election Day, but the president’s party has lost the popular vote for the House by 4.9 percentage points. That gap is partly explained by voters’ tendency to seek a balance of political power even if they like the president — something that may be especially relevant this year because, when voters voted Republican for Congress in 2016, most of them expected Hillary Clinton to be president. Republican candidates for the House won voters who disliked both Clinton and Trump by 30 percentage points in 2016. If, hypothetically, Democrats won that group of voters by 30 percentage points instead this year, they’d win the popular vote by around 10 percentage points, not far from where most generic ballot polls have the race. Independent expenditures (IEs) reported to the Federal Election Commission (FEC) for general election House and Senate contests have continued on a record pace, totaling $695 million through October 21st. This is $103 million more than on the same date in 2016, based on a Campaign Finance Institute (CFI) analysis of data supplied by the FEC. Detailed data on all races with independent expenditures, and on the organizations making the IEs, are available and updated daily on CFI's website via these links: House | Senate |Spenders. 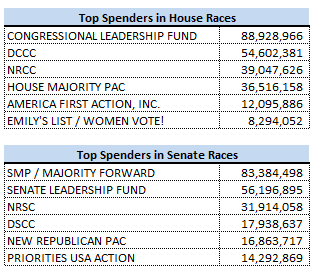 Eight of the top ten spenders in the general election are party committees (DCCC, NRCC, NRSC, DSCC) or organizations, mostly Super PACs, tied to the congressional leadership. These organizations were responsible for a combined $409 million, or 59% of all general election IEs through October 21. Breaking them down, the leadership-related entities have been responsible for $265 million and the formal party committees $144 million. This is the first time the leadership-related committees have been quite so important. In 2014 the leadership-related groups spent about half as much as the formal party committees. By 2016 they had pulled almost even. This year, the leadership-related entities so far have come close to doubling the formal party committees. With respect to the partisan breakdown: All IE spending has been virtually even in the amount spent to support Democrats and Republicans. Republican candidates currently hold a slight edge at 51% to 49%. A large number of House races are considered to be competitive this year and IE spending decisions are backing that up. In 2016 there were forty House races that had $1 million or more in independent expenditures through the entire general election. With two weeks still remaining before the 2018 election, there are already sixty-two districts with over $1 million in outside money. The competitive landscape in the House is heavily weighted towards Republican incumbents defending their seats. The top ten House races by IE spending, each exceeding $9 million, all represent such districts. On the Senate side, the situation is mostly reversed with Democrats defending seats in seven of the top ten races. House GOP leaders, fearful of the staggering amount of cash fueling Democratic candidates this cycle, are leaning on safe and retiring members to pony up to save the House. At the outset of a private call with members last week, Majority Leader Kevin McCarthy (R-Calif.) and Majority Whip Steve Scalise (R-La.) implored lawmakers to donate to the National Republican Congressional Committee or vulnerable colleagues. And NRCC Chairman Steve Stivers (R-Ohio) has been working the phones in one-on-one conversations to persuade members to give. The drive, according to four senior Republican lawmakers and aides, is focused on members with easy reelection campaigns or who are retiring from Congress next year — people sitting on piles of cash that could be used to save vulnerable incumbents. Leaders are targeting some powerful outgoing chairmen, typically the most prolific fundraisers, who haven’t met their annual required “dues” to the NRCC, according to multiple sources. Issue One, a political reform organization, has a report on party dues here. 1. Money that is raised, usually by “dialing for dollars,” by a member on behalf of the party, which goes directly into the party’s war chest but is credited to the member. 2. Money that is transferred from a member’s campaign committee or leadership PAC to the party. 3. Money that is transferred from a member’s campaign committee or leadership PAC to fellow members and/or candidates in tough races. It was a rare bright spot for Republicans in a fund-raising picture otherwise dominated by Democrats on the strength of their breakneck small-donor fund-raising by candidates in key congressional races. By contrast, Republicans owe their cash-on-hand advantage to brisk major-donor fund-raising, and a slower pace of spending, by their party committees and super PACs. Republican super PACs aligned with leadership in the House and Senate raised an enormous sum of $63 million in September, as the groups stepped up their fundraising and spending efforts in the final two months before Election Day to boost GOP candidates’ chances in the midterm elections. About 70 percent of the money raised in September by the two super PACs working to elect Republicans to Congress came from the party’s biggest benefactors in the midterms, records show: Sheldon and Miriam Adelson. The latest donation brings their total contributions to the midterms to at least $112 million — cementing their status as the biggest donors this election. The two Republican super PACs — Senate Leadership Fund (SLF), aligned with Sen. Majority Leader Mitch McConnell (Ky.), and Congressional Leadership Fund (CLF), aligned with House Speaker Paul D. Ryan (Wis.) — have been flooding the airwaves since September with a torrent of hard-hitting attack ads to boost Republicans and improve their chances of maintaining control of Congress. But whereas campaigns get discounted TV ads rates, super PACs have to pay the full amount, which reduces the amount of airtime they can buy.